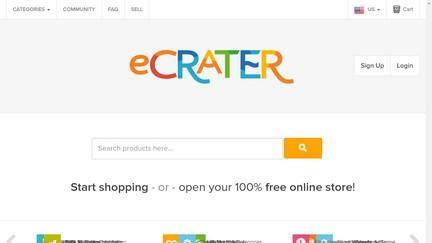 Ecrater is a free online marketplace where sellers can create and build their own stores and sell their merchandise. It is a legitimate online auction store that’s not as large as its popular counterparts like Listia, eBay, and iOffer but also has a large following. Using this site is quite easy as sellers can make their own shops within minutes and there are no limits as to the number of products that a vendor can sell. Buyers can literally search and browse among millions of different products from Antiques to Electronics to Real Estate to Sports Equipment to many other categories that might have something that they need or interests them. What makes Ecrater a good online shopping website is it has many users, both sellers, and vendors alike. Because of the great volume of visitors to the website, it’s good for business as it provides an adequate audience for the items that the vendors sell. Compared to other online auction sites, Ecrater is unique as it doesn’t charge its users any fees. Be it monthly usage fees or seller verification fees, Ecrater doesn’t have such charges to the vendors that use its site which is beneficial to all. With no extra fees, vendors can freely sell their products at reasonable prices, a win-win situation for both the sellers and the buyers. What makes Ecrater special is its site is very easy to use. All the options that its users need to choose are laid out in an organized and uncomplicated manner. 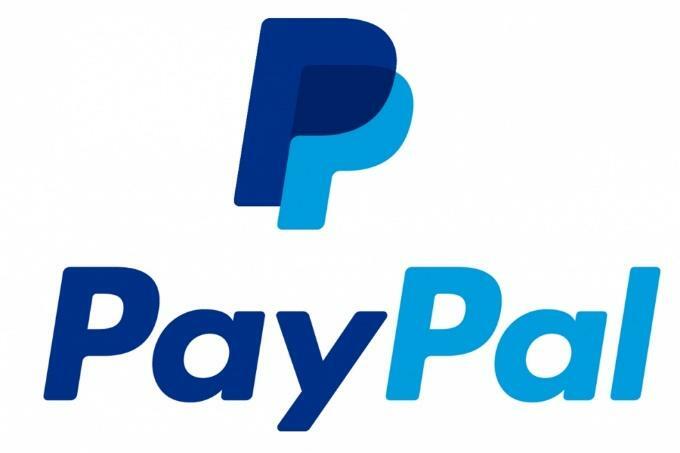 The payment of orders is also easy as there are various payment options that the customers can select and it’s not limited to just debit and credit cards but it also accepts other payment means such as PayPal, personal checks, money orders, Collect on Delivery (COD) and others. Sellers at Ecrater are not required to pay for any final value fees when they make a sale unless they have agreed to a certain arrangement that their products will be advertised in the main marketplace. Vendors can opt out of this option as it is not mandatory but it will mean that their products are less likely to be noticed by the customers. The charge for having their products endorsed by Ecrater in the main marketplace will only be 2.9% of the total amount of the product that they have sold. Unfortunately for international clients, Ecrater is only available to US vendors and customers since its vendors only ship products within the United States. A customer or seller must be in the US to be able to use this site’s services. The founder of Ecrater is Dimitar Slavov and he launched the shopping website back in September of 2004. In just 4 years, the items registered for sale at the website has already reached more than 1.5 million and at the year 2009, Ecrater has over 65,000 active stores and over 95,000 stores have been made since it was launched. Sellers are guaranteed to have a great number of potential customers since their products are directly fed to Google Shopping, bringing in additional traffic to view their products. The lack of customer support options available at Ecrater can be listed as one of the disadvantages for its users as its representatives can only be contacted via email. There are no options to contact the customer support team via phone or through the live chat options. There have been many reviews on the internet regarding the legitimacy of Ecrater as a shopping website. Reddit is one of the online discussions pages where various customers share their thoughts regarding the free online shopping page. The customer reviews for the online auction site is quite divided as many customers provide good reviews while an equally great number of customers accuse it of fraud. It’s undeniable that there is truth concerning the positive and negative testimonials provided by various customers for the site but Ecrater itself is not to blame for the bad incidents. The site itself is simply a platform that is used by various sellers and it’s inevitable that there will be shady sellers mixed up with the genuine ones. Ecrater is not alone, there are also various online shopping sites that are used by scammers to defraud innocent customers. It is somehow the buyer’s responsibility to check the reputation of the seller for them to be safe. They should avoid purchasing from vendors that hay even have the slightest hint of being a fraud just to be sure. Even if there are some scam vendors on this website, it does not diminish the number of legitimate sellers that keep their end of the deal. Customer Ljohnson9487 gave Ecrater a 5-star review for his ease in purchasing his eBook here. The price that he got his eBook for is even 70% cheaper than other popular bookstores such as Amazon Prime. Though he was skeptical at first, he tried ordering and was pleased to have the eBook download link sent to his email an hour after he paid his order through his credit card. 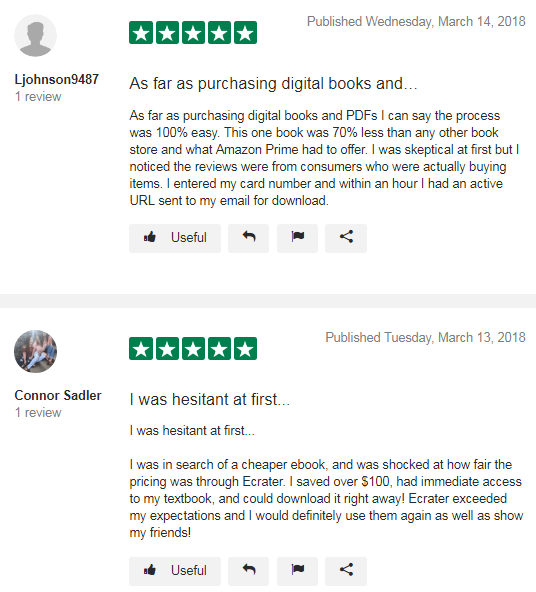 Connor Saddler also had the same great experience of getting his eBook at a much cheaper price here at Ecrater. Saving over $100 USD in his purchase, he was able to have an immediate access to the download links right after paying. The site has exceeded his expectations and will be recommending it to his friends. Basically, no fees are asked by Ecrater from its users (sellers). Fees will only be collected by the site when the sellers agree to allow Ecrater to include their items in the main marketplace where more people can see them. This offer is only optional but when availed, Ecrater will only take 2.9% of the total amount of the item sold. Ecrater is a genuine online shopping site where its users are free to sell their products and buyers are free to browse millions of item sold here. There were just a few issues with a few sellers on the site that turned out to be bogus but the overall feedback of the buyers is positive. This site can only be used by US customers and sellers and it’s a good place to look for affordable products to buy.